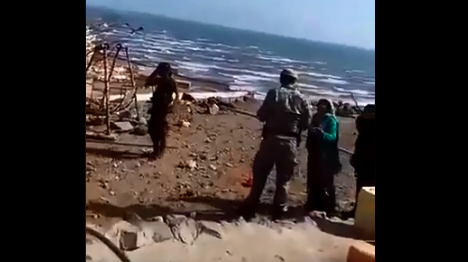 A Yemeni journalist from Lahj province on Sunday has published video footage of militias loyal to Shalal Shaye, who is backed by the UAE occupation forces, assaulting women and firing live bullets in order to intimidate them during a clash in the province of Aden. “The militias of Shalal Shaye violated everything: religion and land, and are now trying to violate the honour of the people in Aden”, journalist Anis Mansour, Head of Hona Aden Media Foundation, wrote on his Twitter account. He added that this video shows the women’s family defending their honor in the face of the soldiers belonging to Shalal Shaye when they tried to break into the homes of vulnerable families. Mansour noted that these families live in front of the Mercure Hotel in Aden, and Shalal Shaye’s soldiers were taking advantage of the absence of some of their family members by going into their house. The journalist stressed that such a violation of the honor of Yemenis has not happened in this way in any previous age. ماستشاهدونه في هذا الفيديو لن يصدقه عاقل وصاحب اخلاق ورجل مسلم وعنده غيره. ميليشيات شلال وشبيحته انتهكوا كل شيء الدين والارض واخيرا يحاولون انتهاك اعراض الناس في عدن. The Saudi-led coalition makes Yemeni women bleed!